Once again Renell Bank participates in the Trading Charity Day of the Frankfurt Stock Exchange. On 6 December 2018, Deutsche Börse AG and the Specialists active at the Frankfurt Floor will donate the transaction and trading fees received from shares, bonds, funds, ETFs and exchange-traded products (ETCs and ETNs) on the Frankfurt Stock Exchange trading venue on that day. 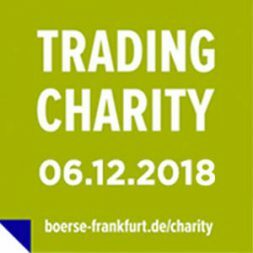 Through the “Trading Charity – trade and help” initiative, Deutsche Börse AG and the companies acting as Specialists will support four local charities: “KinderPalliativTeam Südhessen”, “Leben mit Demenz e.V.”, “Frankfurter Verein zur Unterstützung von psychisch kranken Kindern und Jugendlichen e.V.” and “MainLichtblick e.V.”.